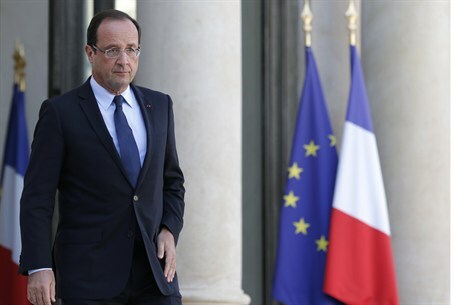 French President Francois Hollande meets Jewish leaders, promises tough anti-terror laws and tighter security. French President Francois Hollande vowed tough anti-terror laws and tighter security on Sunday, as police Sunday staged more raids after a crackdown that saw one man killed and 11 arrested over an attack on a Jewish store, AFP reported. "The state is totally mobilized to fight all terror threats," Hollande said after meeting Jewish leaders at the Elysee palace, vowing that "planned anti-terror laws will be put before parliament as soon as possible." This would help "further strengthen measures to fight this scourge more efficiently," he said. Hollande said Saturday's raids, in which one man was killed and 11 other suspects arrested nationwide, had helped "crush an Islamist cell which we think had struck in the past and which could stage attacks in the coming weeks." He gave no details about the cell, but officials evoked the growing threat of homegrown radical Islamists, many of whom were recent converts. Police shot dead Jeremy-Louis Sidney, a 33-year-old convert to Islam, during a raid over a September 19 attack on a kosher grocery store in the northern Paris suburb of Sarcelles which left one person injured. Just hours after Sidney's death, blank shots were fired at a synagogue in the Paris working-class suburb of Argenteuil. AFP reported that police on Sunday raided an apartment in the French Riviera city of Cannes and searched a vehicle following the arrests of two men there who had at one time given refuge to Sidney. They also seized documents from the flat. Hollande said that France should not "stigmatize" its estimated four million adherents. "The Muslims of France are not all Islamist fanatics," he said, according to AFP. "They are also victims." He said surveillance would be stepped up "at places of worship because secularism, one of France's fundamental principles, directs the state to protect all religions." Interior Minister Manuel Valls meanwhile warned of a surge in homegrown Islamist radicals. "There is a terrorist threat in France," Valls was quoted by AFP as having said in a radio interview. "It does not appear to come from foreigners, it appears to be French converts," he added. Jewish groups on Sunday complained of increasing hate attacks, said the report. "The facts speak for themselves. Anti-Semitic acts are increasing rapidly," Alain Jakubowitz, the head of the International League Against Racism and Anti-Semitism, told the Journal du Dimanche.